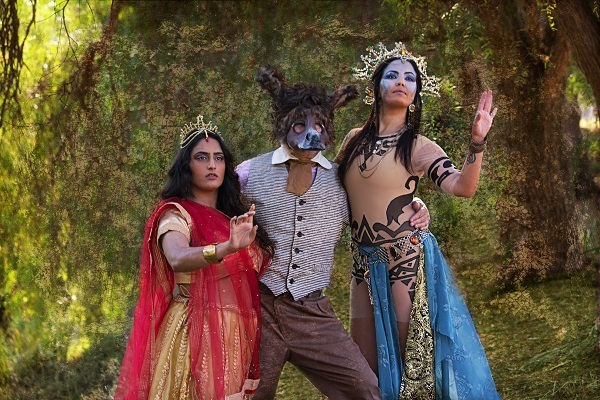 L-R: Pallavi Srinivasan (Peaseblossom), Marc Silver (Bottom) and Nawal Bengholam i(Titania). Photo by Brian Stethem/Cal Lutheran. It was a moment of art becoming life for Kingsmen Shakespeare Company’s associate artistic director, Brett Elliott, when he played Lysander in the festival’s revival of A Midsummer Night’s Dream in 2006. That was the year he proposed to his wife, Jane, onstage while she played opposite him in the role of Hermia. To make it even more romantic (get ready to swoon ladies) Elliott used only Shakespeare’s text, and neither he nor Jane stopped the scene or broke character. He did add a single prop – a real diamond ring. For this production, opening July 15, the roles of Lysander and Hermia will be played by Cal Lutheran alumnus Seta Wainiqolo, a graduate student at Yale School of Drama, and Angela Gulner, a graduate of the American Repertory Theater Institute at Harvard University. Gulner played Viola two years ago in the company’s production of Twelfth Night and was last seen as the French princess, Katherine, in Henry V.
Elliott sets the play in a world reminiscent of the British Raj in India at the dawn of the Industrial Revolution because he has long been struck by several references to the Indian subcontinent in the play. He says the setting is “a place where the logic and technology of the West rubs against the art and spirit of the East, where the ancient mingles with the modern, where love crosses all boundaries, and where all who enter the forest emerge changed.” Resident composer Christopher Hoag has created an orchestral score with a Hindustani Classical influence for the play. A Midsummer Night’s Dream follows the adventures of four young Athenian lovers and a group of six amateur actors, the mechanicals, who are all controlled and manipulated by the fairies who inhabit the forest in which most of the play is set. It was also the first play performed by Kingsmen Shakespeare Company for its festival in 1997. In addition to Wainiqolo and Gulner, the cast will also feature returning Kingsmen veterans Andy Babinski as Philostrate, Michael Faulkner as Theseus, Ross Hellwig as Demetrius, Robert Nairn as Starveling, Jason D. Rennie as Puck, Marc Silver as Bottom and John Slade as Quince. Company newcomer Nawal Bengholam will play Titania. Ty Mayberry follows his title role in Henry V by playing Oberon. In another real life coincidence, Mayberry’s two young sons, Lucas and Leo, will make their stage debut as Changelings. Festival grounds open at 5:30 pm for picnicking and entertainment. General admission is $20 for adults and free for children under 18. Individual tickets are available at the door only. For lawn box reservations, visit kingsmenshakespeare.org or call 805-493-3452. The Kingsmen Shakespeare Company is the professional theater company of Cal Lutheran.